Safe, Effective And Easy To Use! 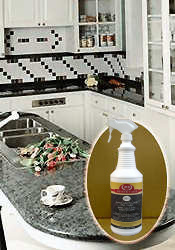 Looking for a safe and effective Granite cleaner? This is a stone friendly daily SPRAY cleaner . It's great for Granite, Marble, Onyx, Travertine, Limestone and MORE! This is one of the most popular products. It's a light duty daily cleaner that cleans quickly and easily. This daily spray cleaner safely removes fingerprints, food residue, and grease. It's not only versatile but effective and easy to use . It's safe to use on ALL Natural Stones and surfaces. Even your most delicate! 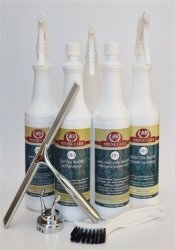 It's a must for the daily cleaning of stones that have been sealed with a penetrating sealer. Comes in a QUART as well as a GALLON ! Great for cleaning Granite Counter Tops as well as your Marble Vanities, Delicate Onyx, Travertine Fireplaces, and Limestone Accents! 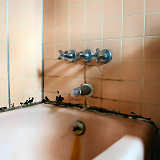 Spray a light mist over the area to be cleaned. Allow it to sit for approximately 30 seconds. Scrub with a sponge or a light duty pad. 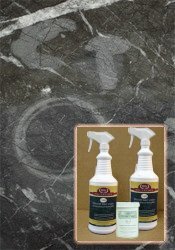 The daily spray stone cleaner is the very best product line available to the end user of Stone for the cleaning and care of stone counters, vanities, shower walls AND all other natural stone. 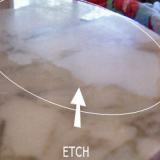 Gentle enough for your MOST delicate natural stone - no soapy film left behind! Remember, you can order this daily spray cleaner in quart or gallon sizes! I just wanted to say Thank you for my natural stone products. I have tried other products in the past and nothing compares to these. I also appreciate how you continue to stay in contact with me about my order.